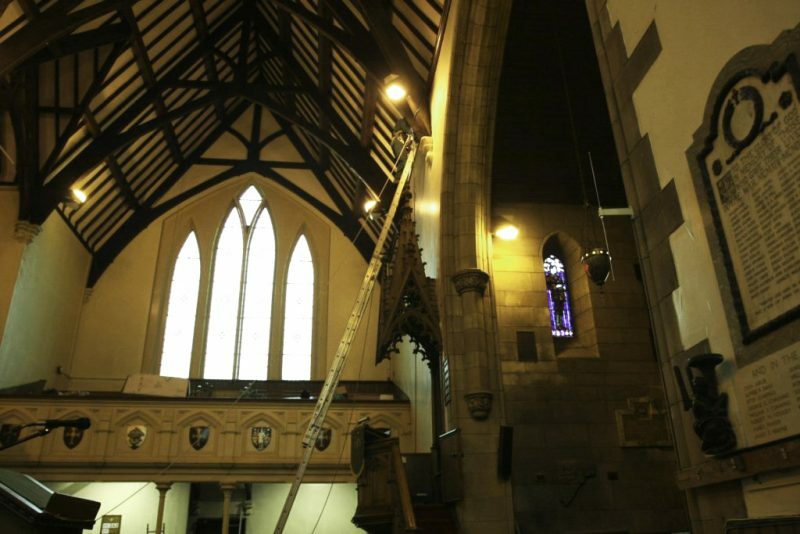 The Architect had identified potential issues affecting the roof structure of a large 19th Century Gothic style parish church in Renfrew, Scotland. Hutton + Rostron (H+R) were instructed to carry out a detailed timber condition survey of the very fine Pitch Pine roof structure by the Parish Church Council. On average, H+R investigate two churches a month across the country. There were many health and safety issues involved with the survey work undertaken by H+R due to the high level access required. Ladders were utilised to reach the majority of areas of the exposed timber roof structure as all H+R surveyors are Ladder Association certified. However, due to small doorways, suspended floors and balconies some areas were still inaccessible. H+R surveyors were able to use their experience working with rope access to reach the inaccessible areas at high level. Risk assessments were continually undertaken to ensure the safe working environment of the H+R surveyors. Working at the higher levels provided some interesting perspectives of the beautiful original church interior which very few people had been able to appreciate before. Serious and structurally significant dry rot (Serpula Lacrymans) decay was identified in the roof structure by H+R. A remediation strategy was devised to eradicate the dry rot infection without recourse to expensive and inappropriate chemical treatments. A repair methodology was agreed with the architect. This allowed for repair works to be undertaken promptly and preserved as much of the historic fabric as possible before the structure further deteriorated.